Art from 88 countries fills the museums, the palazzos, the canal-­fronted warehouses, and t​he small intimate gardens. It’s everywhere! But, alas, perhaps you and I will not be in Venice this year. Don’t despair…we CAN experience it! Lines are forming to see 79­​-y​ear­​-o​ld acclaimed artist Joan Jonas’ exhibit in the United States Pavilion. Jonas uses flashing videos of children playing, environmental elements, mirrors (made in Murano, Italy, famous for its glass-making) and storytelling. The multi-media exhibit, an homage to nature, art and music, is a blockbuster! A huge, sensorial experience. Hundreds of keys attached to bright red yarn hang from the ceiling and transform the Japan Pavilion into an impenetrable jungle. 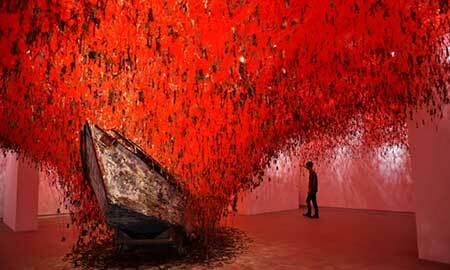 The artist, Chiharu Shiota, feels keys not only lock and unlock physical spaces but memories as well. Cool! We need to go! Kirby, your wonderful blog comments on art from the earliest Egyptians to da Vinci to van Gogh, and now to the Biennale — thank you! If Venice attracts all the art aficionados that it deserves, it is liable to Sink! Thank you for the provocative teaser. I don’t always leave a comment but I look forward to your art blog. The funniest news I heard about this years Venice Biennale was the glitterati who fell into a canal when a dock was over loaded. Have you ever been??? I have not but I am planning on going to the New Whitnry opening exhibit at the end of the month. We’re going to visit our sons family in NY. Thanks again for the blog. 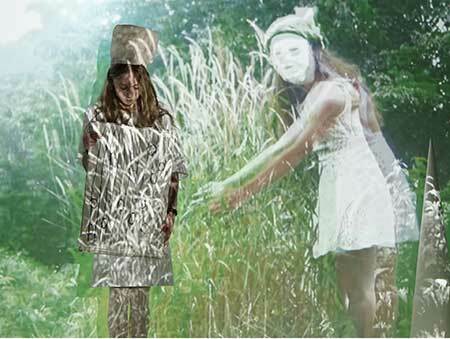 I’m going to Joan Jonas. She looks very interesting. This is absolutely fascinating. I was not familiar with the Biennale but am sending it on to friends who are going to Italy this summer. You are gifted in your selections for the Blog! Has been on my to do list (bucket list) for the past couple years. I guess it now have to will wait for 2016. Tourist crowds not my favorite thing but probably a small price to pay for the spectacle to be seen. WOw! Fabulous Painting! Great Work!